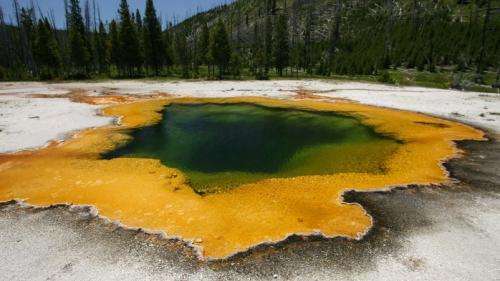 Some bacteria living in hot springs, like those at Yellowstone National Park, produce unique proteins with a special ability to latch onto cellulose. Photo courtesy of Jim Peaco and the National Park Service. The unusual proteins, called tapirins (derived from the Maori verb 'to join'), bind tightly to cellulose, a key structural component of plant cell walls, enabling these bacteria to break down cellulose. The conversion of cellulose to liquid biofuels, such as ethanol, is paramount to the use of renewable feedstocks. In a paper published online in the Journal of Biological Chemistry, researchers from North Carolina State University, Oak Ridge National Laboratory and the National Renewable Energy Laboratory report the structure and function of tapirins produced by bacteria that live in hot springs across the globe, including Yellowstone National Park. These bacteria, called Caldicellulosiruptor, live in temperatures as high as 70 to 80 degrees Celsius - or 158 to 176 degrees Fahrenheit. "These hot springs scavengers make proteins that are structurally unique and that are seen nowhere else in nature," said Dr. Robert Kelly, Alcoa Professor of Chemical and Biomolecular Engineering at NC State and the paper's corresponding author. "These proteins bind very firmly to cellulose. As a result, this binding can anchor bacteria to the cellulose in plant biomass, thus facilitating the conversion to fermentable sugars and then biofuels." In the study, the researchers showed that tapirins bind to Avicel, a cellulose powder that served as a test compound. The researchers also expressed the tapirin genes in yeast; yeast cells with the expressed proteins attached to cellulose, while normal yeast cells could not. The paper also reports the tapirins' crystal structure. "Once we saw how unique the tapirins were at the genome level, we worked with protein crystallographers at the National Renewable Energy Laboratory and were able to determine that the tapirins' protein structure is also completely unique," said Dr. Sara Blumer-Schuette, the lead author of the study and now assistant professor of biology at Oakland University. "Having structural data for the tapirins is crucial and will allow us to continue to focus on the mechanism used by these proteins to adhere to the cellulose present in plant cell walls. This ultimately is enabling us to design superior strategies to overcome the recalcitrance of cellulose and improve biofuels production." "Before now, these proteins were hypothetical proteins, meaning their existence could be predicted but their function never shown," Kelly said. Kelly theorizes that, in places like the hot springs at Yellowstone National Park where food sources are rare, the heat-loving bacteria use tapirin proteins to scavenge plant matter that washes into the hot springs after heavy rains or snow melt. Future work will delve into learning more about the cellulose binding and degradation process, and why a hot springs denizen seems to be so proficient at it. "The end goal is to engineer these bacteria to not only break down cellulose but also to make a fuel - starting with ethanol," Kelly said.